This article is about Japanese pepper. For Chinese or Szechuan pepper, see Sichuan pepper. Zanthoxylum piperitum, the Japanese pepper, Japanese pricklyash, or sanshō (Japanese: 山椒) is a deciduous aromatic spiny shrub or small tree, belonging to the Rutaceae (citrus and rue) family. Natural range spans from Hokkaido to Kyushu in Japan, southern parts of the Korean peninsula, and Chinese mainland. The related Z. schinifolium (Japanese: イヌザンショウ pron. inuzanshō, lit., "dog sansho") occurs as far south as Yakushima, attaining a height of 3 meters. The plant is important commercially. The pulverized mature fruits ("peppercorns" or "berries") known as "Japanese pepper" or kona-zanshō (Japanese: 粉ざんしょう) are the standard spice for sprinkling on the broiled eel (kabayaki unagi) dish. It is also one of the seven main ingredients of the blended spice called shichimi, which also contains red chili peppers. It is also a host plant for several of Japan indigenous swallowtail butterfly species, including the common Papilio xuthus. 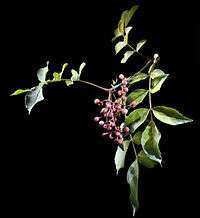 Zanthoxylum piperitum is known in Japanese as sanshō (山椒). Confusingly, the Korean sancho(산초, 山椒) refers to a different if related species (Z. schinifolium), while Z. piperitum is known as chopi (초피). The tree blooms in April to May, forming axillary flower clusters, about 5mm, and yellow-green in color. It is dioecious, and the flowers of the male plant can be consumed as hana-sanshō, while the female flowers yield berries or peppercorns of about 5mm. For commercial harvesting, thornless varieties called the Asakura sansho are widely cultivated. Around September to October, the berries turn scarlet and burst, scattering the black seeds within. 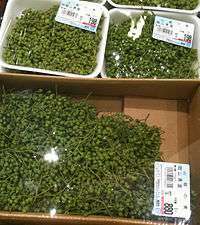 The immature green berries, blanched and salted, are called ao-zanshō (lit. "green sansho"). The berries are traditionally simmered into dark-brown tsukudani, but nowadays are also available as shoyu-zuke, which is just steeped in soy sauce. The berries are also cooked with small fry fish and flavored with soy sauce (chirimen jako), a specialty item of Kyoto, since its Mount Kurama outskirts is a renowned growing area of the Japanese pepper. The thornless variety Asakura sansho derives its name from its place of origin, the Asakura district in the now defunct Yokacho, integrated into Yabu, Hyōgo. In central and northeastern Japan, a non-sticky rice-cake type confection called goheimochi, which is basted with miso-based paste and grilled, sometimes uses the Japanese pepper as flavor additive to the miso. Also being marketed are sansho flavored arare (rice crackers), snack foods, and sweet sansho-mochi. The thick wood of the tree is traditionally made into a gnarled and rough-hewn wooden pestle, to use with the aforementioned suribachi. In Japanese pharmaceuticals, the mature husks with seeds removed are considered the crude medicine form of sanshō. It is an ingredient in bitter tincture, and the toso wine served ceremonially. The pungent taste derives from sanshool and sanshoamide. It also contains aromatic oils geraniol, dipentene, citral, etc. Wikimedia Commons has media related to Zanthoxylum piperitum. ↑ Makihara, Naomi (1983). "Spices and Herbs Used in Japanese Cooking". Plants & gardens. Brooklyn Botanic Garden. 39&: 52. ↑ Montreal Horticultural Society and Fruit Growers' Association of the Province of Quebec (1876). First Report of the Fruit Committee. Montreal: Witness Printing House. p. 25. 1 2 岡田稔 (1998). "和漢薬の選品20：山椒の選品". 月刊漢方療法. 2 (8): p.p.641–645. 1 2 3 4 奥山, 春季 (Haruki Okuyama) (1969) . "さんしょう". 世界百科事典. Heibonsha. 9: 698–9. ↑ 川原勝征; 初島住彦 (1876). 屋久島の植物. Witness Printing House. p. 109. ↑ Shimbo 2001, p.261–, "Bamboo shoots tossed with aromatic sansho leaves (takenoko no kinome-ae)"
↑ "五平餅の作り方". とよた五平餅学会. Retrieved 2011-01-30. shows how-to in Japanese; notes you may add "* sansho, chopped walnuts or peanuts according to taste". ↑ 農文協 (2006). 伝承写真館日本の食文化 5 甲信越. 農山漁村文化協会. ,p.13. In Inadanithe goheimochi is enjoyed with sansho miso in spring, yuzu mison in autumn. ↑ "京山椒あられ". 小倉山荘. Retrieved 2011-01-30. ↑ "山椒あられ". 七味家本舗. Retrieved 2011-01-30. ↑ "実生屋の山椒餅". NPO法人佐川くろがねの会. Retrieved 2011-01-30. ↑ "餅類". 俵屋吉冨. Retrieved 2011-01-30. ↑ Hsu, Hong-Yen (1986). Oriental materia médica: a concise guide. Oriental Healing Arts Institute. p. 382. , "..citral, citronellal, dipentene; (+)-phellandrene, geraniol;(2)pungent substances: sanshool I (a-sanshool), sanshoamide"
↑ This section translated from Japanese version [Medicinal use: 2004.7.23 (Fri.) 21:04 added by user: Kurayamizaka; Active ingredients: 2004.7.26 (Mon) 07:08 by Kurayamizaka], and lists only the active ingredients stated there.